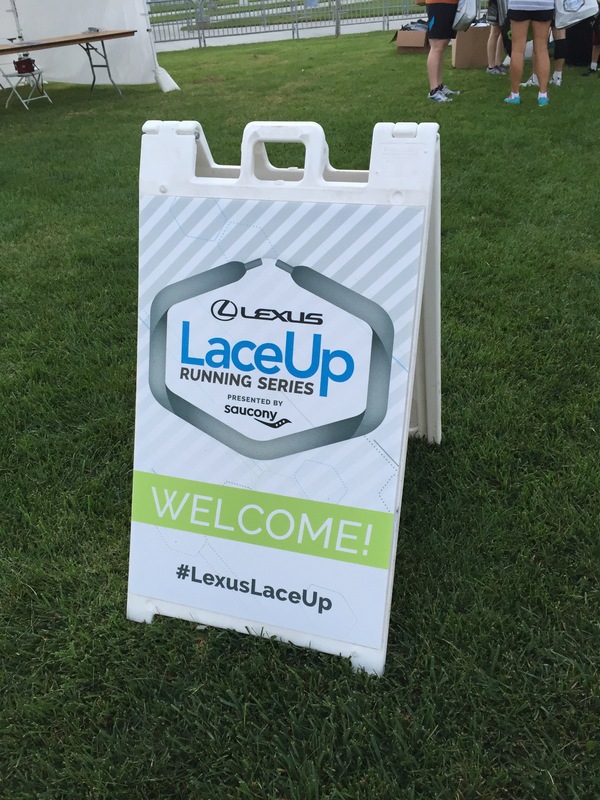 Tie those running shoes for the first stop on the Lexus LaceUp 2015 race series. The series also includes races in Ventura (Oct. 24th), Palos Verdes (Nov. 14th) and Riverside (Dec. 6th). The Irvine race was a little different than the others in the series in that it offered only 10K/5K distances, whereas the other races also include the half marathon. The fact that racers were only running 10K or 5K didn’t seem to dim anyone’s spirits, as a festive bunch of runners gathered in the park on a Saturday morning for fun jaunt around Irvine. Get your registration tent on! Registration costs for the entire Lexus LaceUp series are reasonable with rates that are below the fees charged on bigger corporate race series. For Irvine, rates on the 5K started at $25 for earliest of birds on their way up to $40 the day before race day. The 10K was a similar low price ranging from $45- $60 depending on when you signed up. In addition, Lexus had plenty of discounts listed on line (check out social media) as well as discounts offered by their “ambassador corps” (including yours truly). 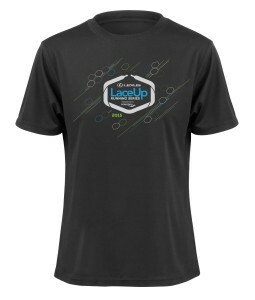 A discount is also available for runners who sign up for the “LaceUp Challenge” (running all 4 races in the series). The race offered packet pick-up the day before at one of the local running stores, but also allowed same day pick-up (at no extra charge… just be sure you get there early). As the race was a little bit of a drive from my home, I opted for the race day pick-up and it only took me 5 minutes to get my bib and swag from the great race volunteers. Since the race was being held at a local park (Mike Ward Community Park), they had the lot reserved for the runners, along with an overflow parking lot at a nearby church for the latest of late comers. 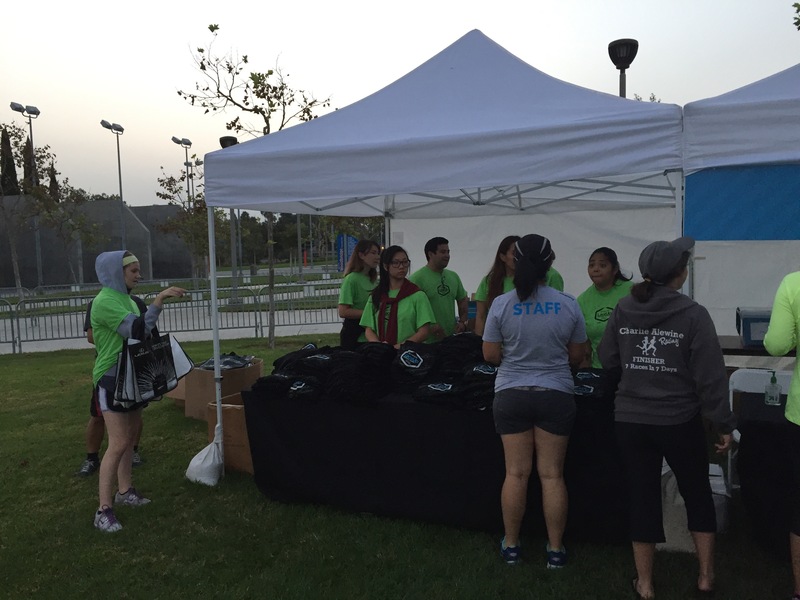 While the Lexus LaceUp Irvine 10K/5K was a more intimate affair than some other races, they certainly didn’t skimp on the swag. All participants received a cool black tech shirt (with the race location on the sleeve) and a stylish “honeycomb-esque” shaped finisher’s medal (5K had green ribbons, 10K blue ribbons). 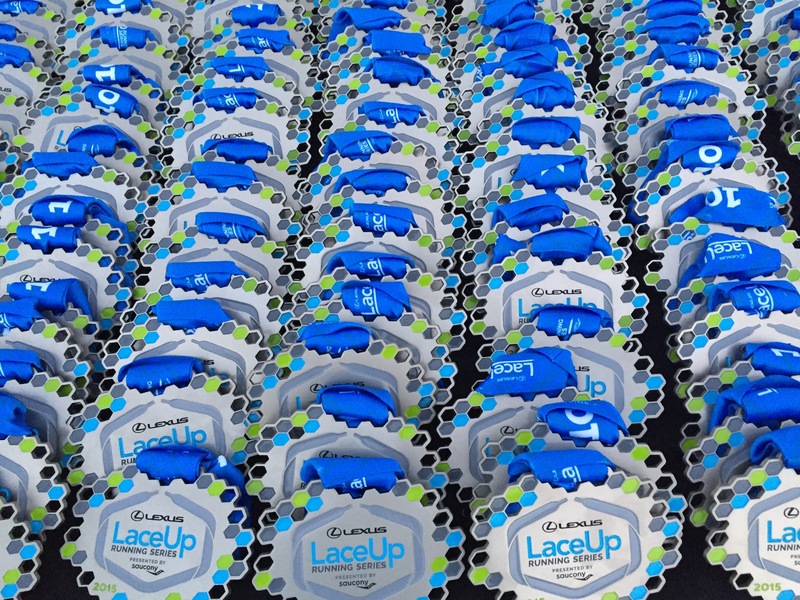 FYI, an extra medal will be awarded everyone who completes all 4 races in the LaceUp Challenge. For the Irvine race, early arriving runners also got a little extra bit of swag as Sierra Nevada handed out bottle openers (a nice sign of things to come after the race). And Lexus was on hand giving out some sweet water bottles to anyone who stopped by their water table before or after the race. And the race swag was presented in a neat reusable shopping bag (which is great now that supermarkets in CA charge for bags), which was a nice touch. And the swag didn’t end there as all runners were given “free” race photos for Facebook (and to download), courtesy of Runner Buzz. In this age of paying $30 for a single digital race photo, free pics of your sweaty self are a very welcome perk. 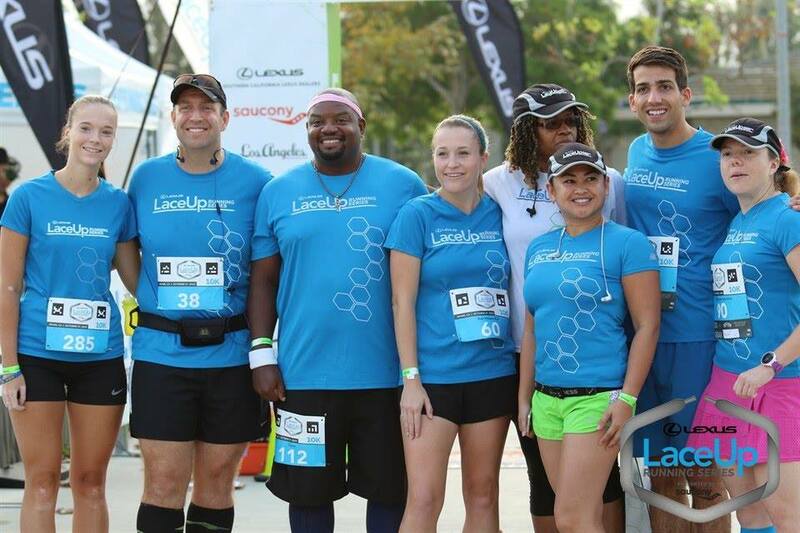 The LaceUp Irvine 10K/5K featured “out and back” courses. While both races started and finished at the same spot in the park, the 5K and 10K each basically had their own unique courses, which kept congestion to a minimum. The courses for the race basically took runners along the bike/running paths near the park and ran us along one of the municipal waterways (of course we’re in drought-ridden CA, so there really wasn’t any water to speak of). While it wasn’t an overly stunning course visually, I enjoyed the route. Fortunately, we never had to cross any city streets as the bike path dipped under the surface streets, which also added a few inclines and declines to an otherwise flat course. In addition, the race featured an “open” course, which meant we did share the route with non-racers (aka other runners/walkers and bikers) but it never really presented any kind of difficulty or bottleneck. For a 10K/5K, outside of signs pointing the direction, you typically don’t need too much in the way of course services. Signs and volunteers lined the course at key points to make sure runners didn’t make a wrong turn. For the 10K, the race provided a water/energy drink/snack stop at mile 2, which also doubled as the stop on mile 4. On races of this length, I carry my own water bottle, so I don’t need to stop. But I’m also sure to wave and thank the volunteers as I run by. And as for the important porta potty question, the race featured a good number of porta potties (actually pretty nice ones as porta potties go) at the start finish/area. The course, however, didn’t sport any additional porta potties, so runners had extra motivation to finish quickly… should nature be calling. Mile markers signs were posted at each mile, but the only timer appeared at start/finish, so be sure to bring your own GPS watch if you need to track your progress during the race. Runners all had B-tags on their bibs, which provided you race results and info on-line after the race was finished. As we crossed the finish line, runners were greeted by volunteers and handed their race medals. After that, runners could go visit the finish line area which featured a few tents from local vendors and a nice car display from series sponsor Lexus. I was curious to check out their great SUV, but given how sweaty I was, I opted to be kind and not take a seat inside one of the pristine vehicles. One final great race perk: each runner got free brunch food from one of three food trucks. I opted for a “stadium dog” from Dogzilla. And to wash it all down… how about a free beer from Sierra Nevada in the beer garden? 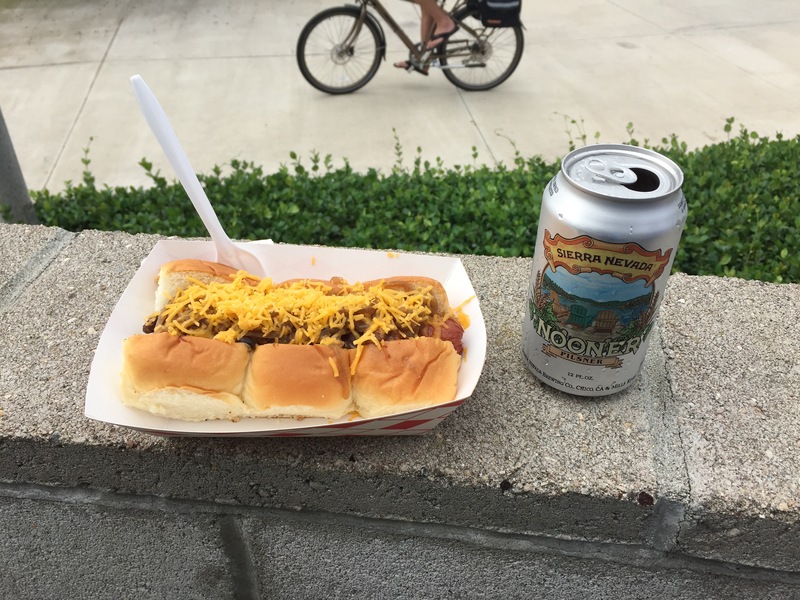 Now most people wouldn’t think that chowing down on a chilli dog and beer at 9am is anyway to start the day. But after running a 10K, it was a bite (and drink) of heaven. Since I’m one of the Lexus LaceUp Series ambassadors, I naturally have a personal interest in the series. But I enjoyed the LaceUp race experience this weekend. Some races, especially bigger ones with several thousand participants, can be overly complicated and a bit stressful. I liked the low-key and intimate nature of this race. I drove to the location, easily parked my car, got my bib/swag lickity split and had a nice casual run with several hundred other enthusiastic racers. And afterward I got to chat with friends and have a beer and some grub before getting on with my day. Not a bad way to spend a Saturday morning. Looking forward to running the next leg in the LaceUp series (Ventura) next weekend. 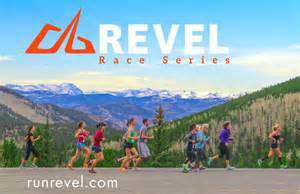 Posted on October 19, 2015, in General, Race Review and tagged DogZilla, Lexus LaceUp Series, Runner Buzz, Sierra Nevada. Bookmark the permalink. 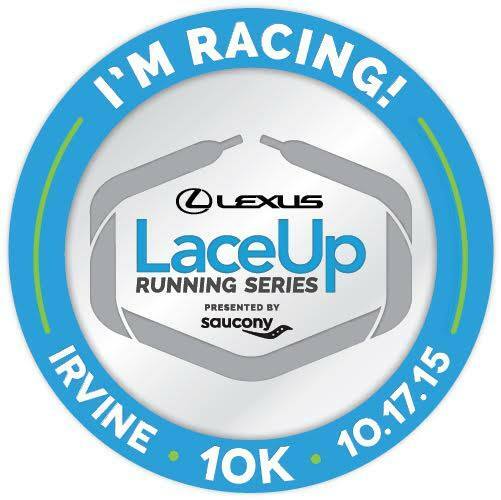 Comments Off on REVIEW: LEXUS LACEUP IRVINE 10K.